When I have few hours with nothing to do at home, I always ended up in the kitchen making something. Today was no difference. I wanted zha jiang mian 炸醬麵 (fried sauce noodles) for dinner but don't fancy using dried noodles. So I made some rustic pulled noodles. I am not expert enough to make those super pulled noodles. My version is easier and more rustic. Beat the egg and salt in a measuring cup. Top up the egg with water to 1/2 cup (125ml). Stir. Put around 250g of the flour in a mixing bowl, pour in the egg mixture. Start mixing till all the dry flour is absorbed into the dough. This dough should be quite stiff. If a bit sticky add in more flour. When the bowl is clean, cover and leave to rest for about 15 minutes. Then knead the dough. The dough should not be sticky, so you may not need any dusting flour at all during kneading. Knead the dough till very smooth and stretchy. Or like me being very lazy, I knead a few times then lift the dough up and smack it hard against the working surface, doing this about 10 times will soon make the dough smooth and elastic. Good way to release stress!! Leave the dough to rest for 30 min - 1 hr. Then roll it out to a long rectangle or oval (see slide show), then roll up the dough (coil). Then roll it out again. Do the rolling out and rolling up about 3 times. This is to help the dough getting very stretchy for later. If you find the dough getting stiffer and stiffer to roll, let it rest for few minutes, the dough will relax and it will be easier to roll out again. Dust the dough top and bottom generously, roll the dough as thin as you possibly could, about 2mm or less is fine. Dust with plenty of flour again and smooth the dry flour all over the surface. Dusting is very important to release the noodles later. Cut the dough into noodles about 4 mm thick. 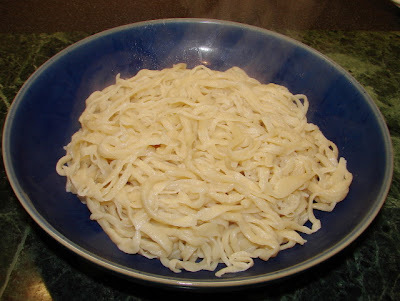 Do try to cut the noodles evenly in width and all the way through without any bit of dough sticking to the next cut. It is also good to dust flour between the cuts. Then come the boring bit to unfold or uncoil the noodles. This may be very quick or much longer depending on how much the dough was dusted earlier, if not enough dry flour the cut dough (noodles) will stick together, you will need to pull it out painstakingly one by one. Put the unfolded and uncoiled noodles neatly in a pile, dusting with flour as you go along. When you have done all that the next step is fun, take about 8- 10 strands of noodles one at a time. Pull and gently swing the noodles up and down to stretch them far as you can go before the noodles start to break. Leave these noodles in another pile and dust with more flour. You will find the noodles quite stretchy can stretch up to 3 - 4 times or more if you are a bit more experienced. When you have done all that above, the noodles can be ready to cook. If you still want the noodles to be a bit more thinner you can stretch them further by lifting the noodles and shake them up and down. The more you do this the thinner the noodles will become. Now they are ready to cook in rolling boil water for about 1 min. Make sure you loosen them with fingers before adding to the boiling water. Drain and toss with a little oil to prevent sticking. Ready to eat. 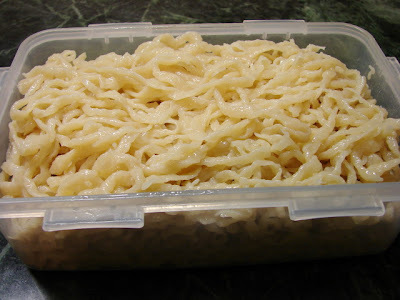 These noodles are not very good to keep in the fridge raw, they are likely to stick together. Best way is to boil the noodles (in a large pot of rolling boil water) for about 10 seconds, drain and rinse with cold running tap water. Shake off excess water and toss with some oil then put in plastic container and straight into the fridge. Will keep in the fridge for about 2 days. To use loosen with a sprinkling of water then microwave till hot. Hi, if you want to reduce salt go ahead. I was taught salt will make the dough firmer and more elastic. No problem with making larger quantity just takes longer. Beware if you stack the noodles together in the fridge without cooking they can clump and stick together. Best blanch briefly and coat with some oil, cool then store in fridge.